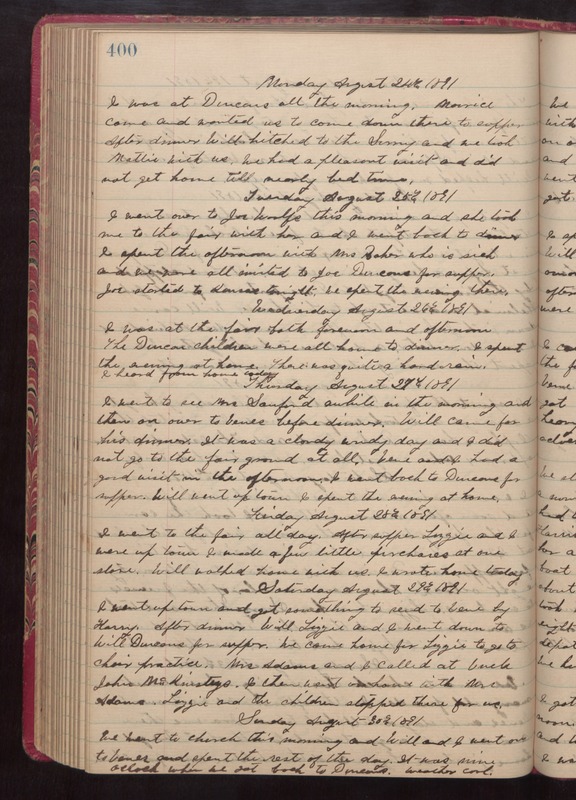 Monday August 24th 1891 I was at Duncans all the morning. Maurice came and wanted us to come down there to supper after dinner Will hitched to the Surry and we took Mattie with us. We had a pleasant visit and did not get home till nearly bed time. Tuesday August 25th 1891 I went over to Joe Woolf's this morning and she took me to the fair with her and I went back to [illeg] I spent the afternoon with Mrs Baker who is sick and we were all invited to Joe Duncans for supper. Joe started to Kansas tonight. We spent the evening there. Wednesday August 26th 1891 I was at the fair both forenoon and afternoon. The Duncan children were all home to dinner. I spent the evening at home. There was quite a hard rain. I heard from home today. Thursday August 27th 1891 I went to see Mrs Sanford awhile in the morning and then on over to Venes before dinner. Will came for his dinner. It was a cloudy windy day and I did not go to the fair ground at all. Vene and I had a good visit in the afternoon. I went back to Duncans for supper. Will went up town I spent the evening at home. Friday August 28th 1891 I went to the fair all day. After supper Lizzie and I were up town. I made a few little purchases at one store. Will walked home with us. I wrote home today. Saturday August 29th 1891 I went up town and got something to send to Vene by Harry. After dinner Will, Lizzie, and I went down to Will Duncans for supper. We came home for Lizzie to got to choir parctice. Mrs Adams and I called at Uncle John McKinstrys. I then went on home with Mrs Adams. Lizzie and the children stopped there for us. Sunday August 30th 1891 We went to church this morning and Will and I went on to Venes and spent the rest of the day. It was nine oclock when we got back to Duncans. weather cool.